an innovative approach to learning golf. Learn the skills to improve your game and to play golf. Build confidence and lasting friendships. Experience competence in a fun, relaxed, supportive environment. Prepare for a lifetime of enjoyment. Let’s face it, golf is a difficult game. It challenges frustrates and gives us pure joy… usually all in the same round. We all love the feeling of succeeding and having fun at golf, which is why we practice and play. 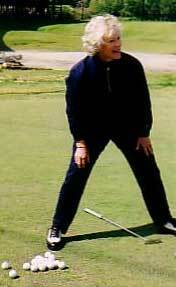 Take lessons to gain confidence for your next golf outing… if you have the desire, you’ll have the ability. Golf perfection is unattainable, but game improvement is not. Whatever your current level of skill, from beginner to low handicap, professional golf instruction is your ticket to improvement and shaving strokes off your scores. Jeri O’Hara provides the perfect mix of patience, positive reinforcement and a sense of humor to make learning fun. Practice alone only grooves your bad habits and makes them permanent. It is better to learn the proper fundamentals from the beginning, as it is much easier to learn the right way than to “un-learn” the wrong way. Taking lessons at a driving range just makes sense. After you lesson, you can immediately set to work implementing all that you learned.